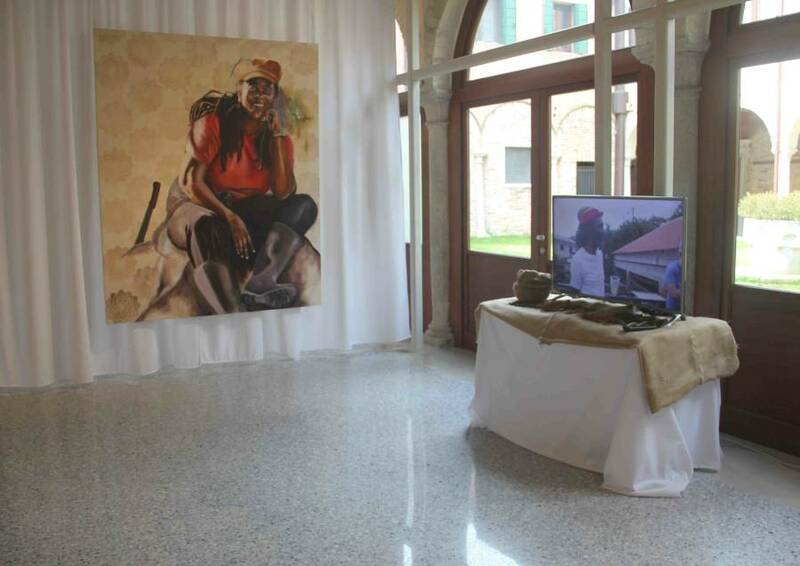 The Grenada National Pavilion in its first time participation at the Biennale d Venezia occupies a place that is easy to be found. Steps away from the Zattere vaparetto (water taxi) stop, it shares Dorsoduro with such nobel institutions as the Academia, an several other National and collateral events. Even if one were not making a bee line to this Caribbean spot of warmth, you could easily stumble in. And what a fortunate stumble that would be. Curators Susan Mains and Franceso Elisei have combined forces to present a pavilion that is characterized by Italian elegance, and warmed by the panache of Grenada. 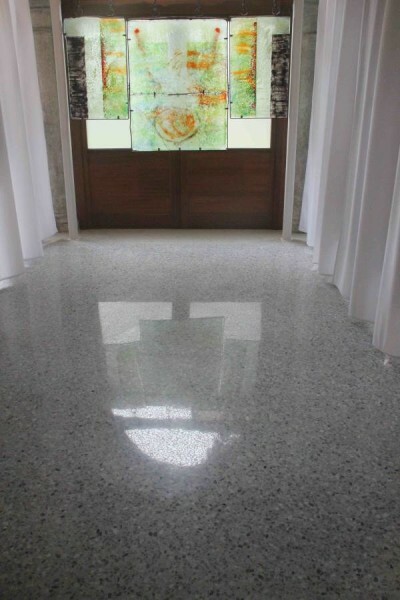 Set in the beautiful and historic cloister of the Gesuati, one steps away for a moment from the hustle and bustle of Venice. It is a green place, with a tree. A tree. When one thinks of the topography of Grenada, where it is rare to find a spec of land that is not covered completely by trees, here in Venice one tree is notable. Nevertheless, the tree sets the tone for the connectedness to the earth and its people that is palpable in the Grenada Pavilion. The title, Present Nearness, gives a bit of a mystery, but is evident by the time the exploration of the pavilion is complete. Asher Mains’ art portrays the cocoa farmers of Grenada — beautiful, hard-working people, who possess a deep, hard-earned dignity about themselves and their work. A video documentation shares his project of creating portraits of individuals, and giving to them to have in their home. He wants to see what happens when some of the people who are at the lowest rung of the societal ladder are honoured as if they were royalty or celebrity. A large painting of one farmer, Joanne, smiles down and welcomes every visitor. The background pattern, created with actual cocoa, is reminiscent of a luxury branded item. Opposite on the wall hangs the painting of Carmine Ciccarini, Italian painter of humans in their urban settings. Here in a cafe in London, two ladies sit and enjoy a quiet coffee — the end result of the labour of many hands. His style mimics an old photograph, with sepia tones and the minimal earth tones of yellow and pink ochres, inspired by the colors of Naples. Following our eyes encounter the photographic work of Francesco Bosso. Using traditional camera and film, this dramatic seaside scene is filled with the reflected light of a wave crashing into vertical cliffs. Printed on silver paper, the light dances, and if you stay and look long enough the wave moves. His work gives strong messages of the power of nature, and therefore the artists’ connectedness. We turn now for a quiet moment into the chapel like space of Maria McClafferty. Her glass and steel sculpture hangs from chains, and round manacle-like hooks, giving visual cues reminiscent of the slavery history of the Caribbean. In the glass is portrayed a woman, a fetus like image incubating amidst her suffering. The image is subtle, set in translucent, soft greens and blues. Upon closer inspection, the intricacies of the bubbled glass gives an abstract quality, suggesting that perhaps McClafferty’s strong desire to portray a disordered world is also ameliorated by the Caribbean environment of the blue of sea and sky. A balm, an oasis, a healing. Maybe. Around the corner, Oliver Benoit abstracts paint in many, many layers. His notion of escaping the perpetual cyclical patterns of violence from the disenfranchised is set in a plane of expanding vertical lines. The density of the centre gives way to light and space on the sides of this plane as small boxes float in self similar patterns on another level. The imagination is drawn to what if — what if this were an actual 3D work, and the lines become roads, on a flat plan, and the boxes actually float at different levels above them. Would this be a town? A city? A metropolis? One wants Benoit to give us more. He is only teasing us with this first iteration. 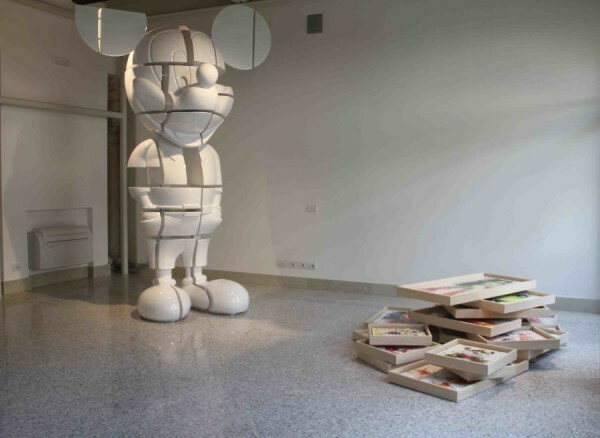 Giuseppe Linardi brings to the pavilion a most memorable visual — a three meters high “turpino” or Mouse. A well-recognized icon, one’s first impression is “What does this have to do with Present Nearness, and the disorder of the world?” A deeply thoughtful artist, Linardi explains the installation, which also includes a pile of paintings stacked on the floor. These paintings also have his particular “decodifiazion” style, portraying childhood story icons. He purports that children also suffer from the disordered world, and the easiest way for a parent to placate a child is to give them a toy. Soon the toys are thrown in a pile on the floor; they do not satisfy the need. He asserts that what children really need is time, love, attention and care, thus assuring us all a better future. Who wouldn’t agree? Exiting the pavilion, and down the hallway with 400 year old brickwork, lies the installation of Susan Mains, None Calls for Justice. Initially intended for the open courtyard of the cloister, through circumstances beyond the control of the pavilion, the installation was made smaller, and more hidden, but still shouts a powerful message. The clothing laid here represents the bodies of those killed by violence — the girls in Nigeria, the students in Kenya, those who have drowned in the Mediterranean and others around the world. Mains’ distress is the imbalance that the world media gives. All lives seem not equal. She asks visitors to lay flowers, or light a candle for those who have died without a voice. And as a final visual, as you are leaving the cloister, the encaustic work of Maria McClafferty, printed on aluminum, abstractly suggests the human form. A part of a large series, the elemental feel of the aluminum against the bricks of the chisea, the colours of image, the gesture of the figures, make it seem like it is somehow has been there forever, and is supposed to be permanent. In this last moment, now the understanding of Present Nearness becomes clear. Being present, feeling the pain of those close to you, and those far, being connected to the earth and environment and offering the smallest handful of hope to the disordered world, this if Present Nearness. This tiny island of Grenada, in the Caribbean, makes a big footprint on the 56th Biennale di Venezia. The participation of The National Pavilion of Grenada would not have been possible without the support of our supporters: Arteeventi, Officina delle Zattere, Zerotecnica, C & C, Danny Fahkre, The Grenada Arts Council, Mrs Victoria Slinger, Insurance Consultants Grenada, Ltd., act – Art and Design, Art and Soul Gallery, Bernardo and Wendy Bertucci La Luna Resort and Villa, DHL in Grenada Renwick and Thompson, Diamond Chocolate Factory, Quinn Co., Netherlands Insurance Co. Ltd., Flyingfish Marine Survey, RBTT, Leo and Lilian Garbutt, Belmont Estate, Terra Caribbean Grenada, Century 21 in Grenada, Grenada National Lottery, and Grenada Tourism Authority.